The chassis is made out of a combination of 25mm aluminium extrusions and 1.6mm aluminium plate, which has been bonded and riveted together. This structure is 100% recyclable. 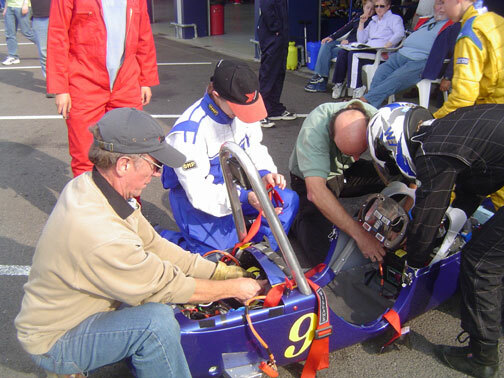 The main running gear has come from and old Go-Kart, this includes axles, bearings, steering components wheels & tyres, brakes and drivetrain. Polycarbonate which is also 100% recyclable has also been used for such things as the steering wheel. The body and paintwork has been supplied by lotus, being of one of their old Soapboxes which have competed in the Goodwood downhill event. The seat belts and brake light have come off an old Lotus Formula 1 car. This part of the car has been designed and made by Robin Shute as part of his GCSE project. More technical information and pictures can be found on the technical specification page. The car has now travelled over 500 miles, and has run for over 22 hours. Qualified for the final in 1st place, only 1.2 miles off the all time distance record which it could have comfortably achieved with its speed around the Bedford Autodrome. 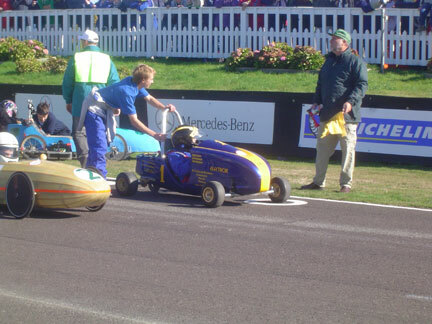 Finished the final at Goodwood in a disappointing 6th place out of the 68 cars which raced that day. Achieved a top speed of 32mph. Averaged 29.5 mph around one lap of Bedford Autodrome, and averaging 28mph for a two hour stint around the same circuit. Able to run for 2_ hours or 72 miles without the need for a battery change. Had no Mechanical breakdowns, bar a small wire shorting out on the chassis. Been one of the most successful cars out of the box with two comfortable wins in its first two events. Able to run quickly with overgrown drivers. Given us a stable base to win next years final with.